From the 16th to the 17th centuries, as the warlord governments gave way to the Tokugawa Shogunate, over 200 castle towns were built in an unprecedented urban construction boom all over the country. This huge leap in urbanization is a unique part of Japan's urban history, and indeed, of the world's. In addition to this concentrated urban development, based on a single shared design philosophy, castle towns formed a unique urban plan based on the power of the samurai and centred on a castle. They differed from the early walled capitals of Japan, which imitated China, and in this sense, they are the most representative of Japanese urban forms. The feudal towns of China and Western Europe are traditionally closed spaces encircled by walls around the town, but Japanese castle towns lack these defensive walls, forming open cityscapes. Castle towns had a great deal of power as centres for the government, economics, and culture of daimyo domains, and are noted for their strict divisions of residence by class. In addition to this, they are noted for the clever use of rivers, canals, and green areas to protect against fire, and offer many suggestions for contemporary urban planning. Kanazawa flourished as the central city of the Maeda's million bushel domain for about 300 years, and even today its old roads and neighbourhoods, its gardens and encircling moats and canals and open spaces, clearly show us the ideas of urban planning of castle towns. Again, traditional culture and arts have been an inherent part of Kanazawa's historical heritage since it was founded, and form a cultural landscape appropriate for a castle town. 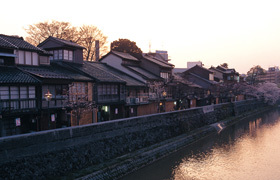 Thus, not only are Japanese castle towns unique in global urban history, Kanazawa itself has considerable value as a representative example of a Japanese castle town.